For more than 25 years, the Jeep Grand Cherokee has used classic design cues to create a style that is sure to turn heads. 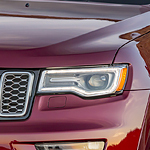 The new 2018 model maintains the classic seven-slot front grille that is so well known on the Grand Cherokee and combines it with newly designed lines and features. With signature headlamps that include automatic high-beams that will adjust in brightness if they detect oncoming traffic, you'll be ready to handle any situation. Additional features include the Bi-Xenon High-Intensity Discharge Headlamps and premium LED fog lamps. Headlamp washers will ensure that your view is never compromised. There's nothing quite like getting behind the wheel of a Grand Cherokee. To take one out for a test drive in Durango, visit Morehart Murphy Regional Auto Center and see the different models we have available on our lot.